If you are living in an apartment, you are most likely to encounter space problems. Smart homeowners purchase multipurpose furniture such as a sleeper sofa that can help them to save some space in their house. A sleeper sofa can serve as your lounging area during the day and can be transformed into a full-sized bed during the night. 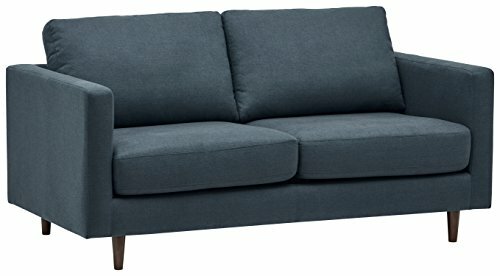 For those who are interested in buying a sleeper sofa, we’ve come up with the list of the top 10 best comfortable and durable sleeper sofas. The following are the best-selling models in the market nowadays and we’re about to know why. 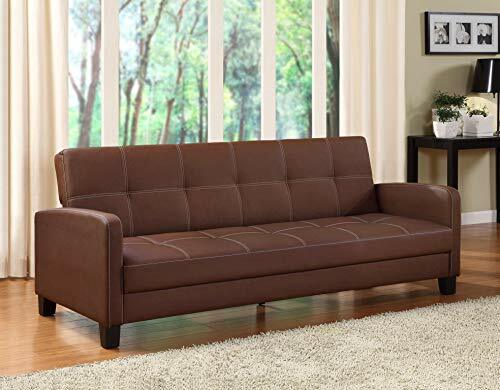 In rich faux brown leather, anyone will turn their head twice to this sleeper sofa from DHP. Its elegant design will fit any modern interior design nowadays. And the contrast stitching is not only for aesthetic purposes, but it can also add to the durability of the product. We like how the faux leather is both beautiful and easy to clean. You can wipe any dust, dirt, grease, and even sweat with just a damp cloth. Wood is a suitable material for sofa frames. Fortunately, its frame is constructed using solid wood. In that way, it can provide excellent stability for you when both sitting or sleeping using the product. You can also convert it from a sofa to a sleeper in just a few seconds. The weight capacity of this sofa is 600 pounds, allowing two adults to share the same bed. Now you can accommodate your guests overnight in comfort thanks to this Ashley Furniture Signature design sofa bed. Who says you can’t sleep in style with this charcoal and modern-designed sofa sleeper? It’s clean and classic, providing an interesting neutral piece in any contemporary-styled house. We also liked its corner-blocked frame that adds more safety especially if you have kids running around the house. The attached back and loose seat cushions provide more comfort whether you sleep or you sit. The high-resiliency foam cushion is wrapped in thick poly fiber that can last for a long time with proper use and maintenance. It also includes two decorative pillows with French scripting to add a tres chic touch to your house. The pillows are covered with linen and soft polyfill. To provide great stability, this product has four exposed feet with a faux wood finish. It also includes a bi-fold queen innerspring mattress that sits atop the metal frame of this sofa. This elegant sleeper sofa from Coaster Home Furnishings is not only stylish but also comfortable. 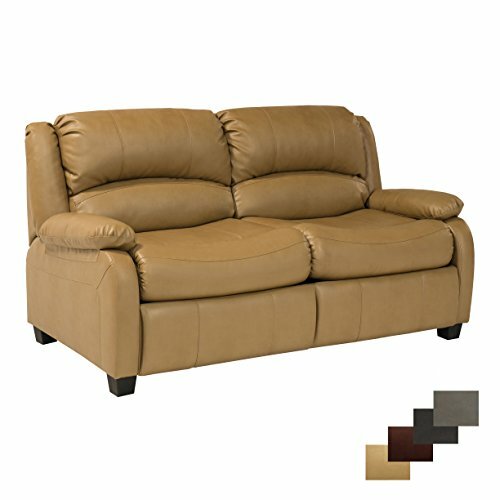 The piece of furniture is wrapped in either dark brown, black, or cream bonded leather upholstery. It also features plush seating and tufted cushions to achieve optimal comfort. Now you can save great space in your house or apartment thanks to this sleeper sofa. You don’t need to burn a hole in your pocket to have a quality multi-functional sleeper sofa in your house. Thanks to its generous size, it can accommodate two adults sleeping at the same time. You can transform it to a queen-sized bed in just a few seconds. Also, with its elegant look, this sleeper sofa will look great in any modern living room or bedroom. Novogartz is known for manufacturing quality home furniture, and this one is not an exception. The premium linen upholstery sofa bed will allow you to sleep in style and comfort. Compared to other sofa materials, the linen upholstery is very easy to clean with a damp cloth. The sturdy wood frame construction provides great stability whether you are sitting or sleeping on this sofa bed. Also, the rubbed tufted cushioned back with comfortable polyester and foam filling provides added comfort. It also features a slanted oak colored wooden legs. Upon arrival, you only have to spend a few minutes in assembling the product, and it’s ready to use. With Novogartz, rest assured that you’re going to experience thoughtful construction and their keen attention to detail makes these furniture pieces stand above the crowd. Another product from Ashley Furniture is this faux weathered leather sofa sleeper in earth color. It is made of 95% polyester and 5% polyurethane for maximum comfort when sleeping or sitting. This classic sleeper sofa will look good in any living room. Featuring its versatile sofa features, it includes round arms, firm seat cushions, and a concealed innerspring full-sized mattress that you can pull out with little to no effort exerted. We also like its easy-lift mechanism that will allow even young adults to transform this product from sofa to a bed in just a few seconds. This sofa is crated with a corner-blocked frame, firm back, and loose seat cushions. Four exposed feet with faux wood finish provides excellent stability. The bi-fold queen size innerspring mattress can be pulled out from the solid metal frame. Now you can enjoy optimal comfort when sleeping thanks to its innerspring mattress that rests atop the east-to-list steel frame. The high-resiliency foam cushions are wrapped in thick basil-hued poly fiber with corded trim. If you loved the previous products we’ve featured from Ashley Furniture, you should check out this model! 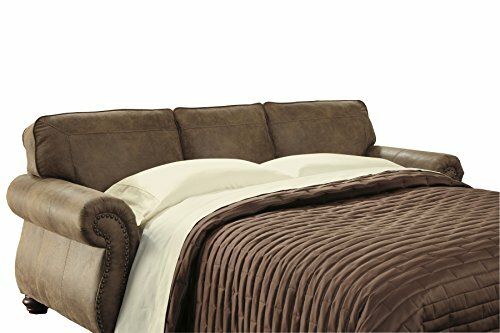 This queen sleeper sofa is perfect for slumber parties infused with the luxurious-looking leather that can fit any modern living room. The sofa is both elegant and lounge-friendly, allowing you to enjoy your sleep without compromising the aesthetic look of the furniture. For modern enthusiasts, the high appeal and versatile bedding option of this product will surely make you want to invest. 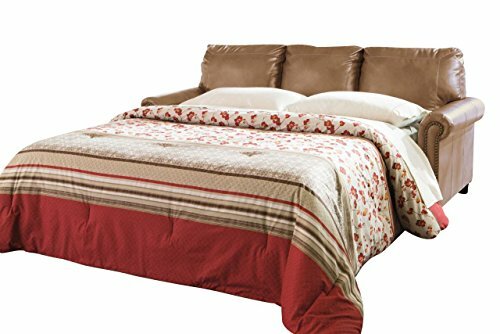 Whether you’re looking for a great small space solution or you want to accommodate your guests at night comfortably, this sofa sleeper is an excellent choice. Upon arrival, all you need to do is remove the wire hold downs, and your sofa sleeper is ready to use. The model is available in chocolate, slate, and almond color. The Ashley furniture sleeper sofa featuring a serene seafoam is a delight to every homeowner because of its setback rolled arms and ultra-soft cushions. Now you can lounge all day and sleep comfortably at night. The plush cushions are covered with the supple polyester blend. The package includes four toss pillows that are made of polyester/rayon and polyester/cotton. It also features an innerspring mattress that transforms into a pull-out queen-sized bed without difficulty. During the day, the bi-fold mattress rests on its solid metal frame for a couch. 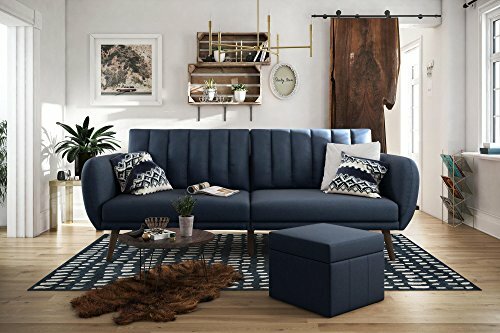 This sleeper sofa is perfect for those who own a studio, a small apartment or wanted to make sure that they can accommodate their guests comfortably at night. Minor assembly is required upon arrival of the product. All you need to do is remove the shipping cleats, and it’s ready to use. Now you can transform your lounge area into a sleeping haven with less than five minutes. 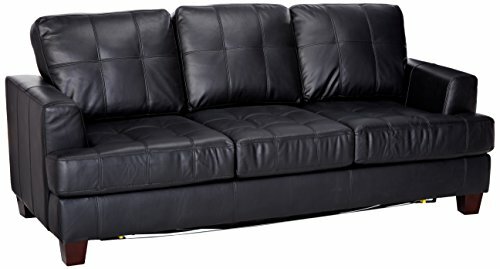 Next, we have the RecPro Charles collection sleeper sofa. This bed loveseat is spacious enough to accommodate two adults at a time. The easy-to-pull out metal bed frame does not take much time, allowing you to prepare your bed in just a few minutes. We also like its espresso faux leather that’s easy to clean even with liquid spills. Rest assured that you’re going to have a good night’s sleep thanks to its 5-inch ground mattress. You don’t need to replace the mattress anymore. The modern design of the sofa will look good in any contemporary-styled house that you own. This hide-a-bed furniture is in rich mahogany color that will complement your existing interior house. It’s also an excellent choice for mobile house owners because it does not consume much space and it’s smaller compared to a standard-size sofa bed. The padded armrest with removable cushion seats makes it more comfortable to sleep in. Lastly, we have the Rivet revolve modern sofa bed. It features class elements that will blend in your modern house design once placed. The clean lines, durable and cozy fabric, plus the comfortable seating makes it more effective in both sleeping and sitting. This smart design easily transforms the sofa into a bed during night time. The solid beech legs and robust wood frame ensures the stability of the sofa. We also like its contemporary and streamlined design. Upon arrival, minimal assembly is required. You only have to attach the legs, and it’s ready to use. It’s not only stylish but also comfortable, acting as a double duty couch and a bed to suit all of your needs.